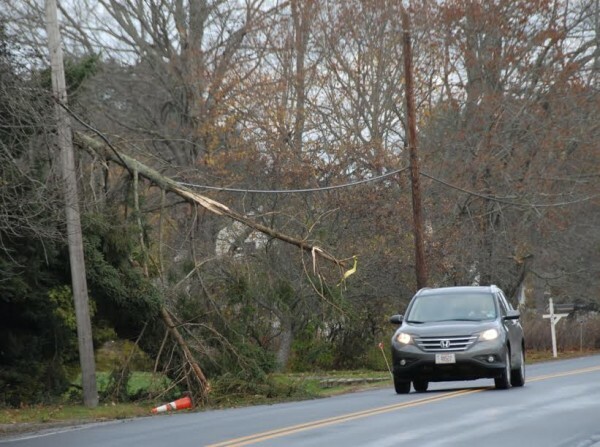 A large evergreen tree that broke and fell on top of a FairPoint utility wire during the storm on Nov. 2 created a hazard for motorists heading south on Hampden's Main Road North. Town, state and FairPoint representatives met Thursday, Nov. 13, 2014, to decide how the problem would be addressed, Maine Department of Transportation spokesman Ted Talbot said Wednesday, Nov. 12, 2014. PORTLAND, Maine — FairPoint Communications’ response time for landline repairs in Maine spiked at the end of 2014, after the company’s two unions declared a strike that hit its 109th day on Monday. A report filed with state regulators shows the company’s response time rose sharply in the last three months of 2014, with nearly 90 percent of landline problems taking longer than 24 hours to resolve in November and December. FairPoint’s 24-hour repair response rate was 38 percent in December 2013 and 24 percent in November 2013. The state seeks that rate to be at or below 12.5 percent for landline service providers. For the final three months of 2014, the company said a glitch caused it not to log any reports of major outages, though it believes some outages would have qualified during winter storms in November. The quarterly report to the Maine Public Utilities Commission covering about 210,000 landline customers is the first to give some way to quantify the strike’s effect on the publicly traded company, which is expected in March to list earnings for the first reporting period affected by the strike declared Oct. 16, 2014. Negotiators for the company and about 1,700 members of two unions began meeting Jan. 2 with federal mediators to help resolve the labor dispute, and through that process, they have agreed not to communicate with the media about related issues. Service quality was an issue early in the strike for both the unions and the company. A union representative declined to comment on the report out of concern for the mediation agreement. Tim Schneider, Maine’s public advocate, said the report confirms complaints his office has received about FairPoint’s service quality since the strike started. The company’s below-benchmark performance for July, August and September is the subject of a separate case before the PUC, which puts the company’s service quality statistics up against new rules that took effect this summer, requiring the company to resolve about 87 percent of all network troubles within 24 hours, averaged over the previous 12 months. The company continues to oppose those new requirements, arguing they are unreasonable and unfair as they compete against companies not required to provide state-regulated “provider of last resort” landline phone service in areas that are not necessarily profitable. The company could attempt to get a bill through the Legislature to modify those requirements, but no such bills have been introduced. Meanwhile, the PUC was not convinced by FairPoint’s reasoning that regulators should consider penalties against the company for its third quarter performance. PUC commissioners Mark Vannoy and David Littell approved opening a case in January to investigate the report and possible penalties for falling short on repair response times and timely installation appointments. “Until that case is decided and until the investigation is decided, we can’t say what the penalty might be,” PUC spokesman Harry Lanphear said. The commission could decide not to assess a penalty against the company. About the third quarter report, FairPoint had argued that problems with its broadband service, which is not subject to regulatory quality standards, contributed to problems resolving issues for landline phone customers. The PUC investigation into FairPoint’s failure to meet performance standards during the third quarter of 2014 also could set some guidelines for assessing the fourth quarter reports, which were markedly worse than the previous quarter. The company provides regulators figures on network trouble, problems not cleared within 24 hours, installation appointments scheduled and missed, service delays and major service outages. The company failed to meet all of the benchmarks but for major service outages, which were not logged at the end of the year as a result of the strike. Davis said the company’s network operations center should have logged “abnormal events” that would have qualified as major outages. “FairPoint is unable to recreate the information and therefore has no ability to determine with certainty whether or not there were outages that met that threshold,” Davis said. She said the company will file an explanation of that absent data with its statement to explain the missed metrics within 10 days from the Feb. 2 filing. The company reported 119 major outages through September and would need to have about doubled that in the last three months of the year to surpass the benchmark of 234 major outages. In 2013, the company had 24 major outages in December and five in November. Schneider said the lack of data is “concerning” and that his office would participate in the service quality cases, but he said the office hasn’t determined whether or to what extent it would support financial penalties against the company. The figures come as the company continues to lose landline customers at a steady pace, down to 210,000 in December 2014 from 281,000 in December 2011. Those losses were sharpest during the period of the strike, with FairPoint losing in November 2.3 percent of the customers it had in October and in December 1.8 percent of the customers it had in November. That’s compared with about 1.7 percent losses in November and 1.1 percent losses in December for the three years prior.